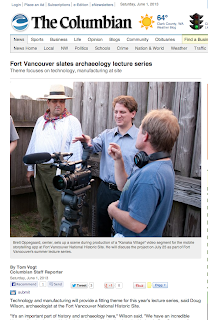 In our continuing quest to bridge mobile digital interpretation with journalism, I am working this summer with Fort Vancouver's archaeologist (and PSU adjunct associate professor) Dr. Doug Wilson to document and embed into the ether the process and results from the annual Public Archaeology Field School. I also will be giving a lecture on my research (as part of a public lecture series) and how it could benefit archaeologists (and public historians) on July 25 at Pearson Air Museum. Fort Vancouver Mobile's permanent exhibit debuts!